Srinagar (Kashmir), Jul 24: Shri Amarnath Yatra crossed 3 lakh mark as Yatra resumed today with 14,950 Yatris leaving for the Holy Cave. An official spokesman said that no fresh batch of Shri Amarnath pilgrims was allowed yesterday to proceed towards the Holy Cave Shrine of Shri Amarnath in South Kashmir Himalayas from Jammu because previous batch of pilgrims was halted at Ramban and Ramsu due to bad weather conditions, an official spokesman said. 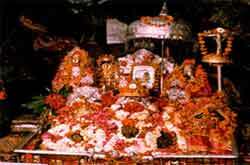 A batch of 2,244 pilgrims, which had left from here in a fleet of 49 vehicles around 5 a.m., was not allowed to proceed further yesterday by the authorities as landslides had occurred due to heavy rains on the National Highway, about 165 km from Jammu, officials said here.The authorities had made temporary arrangements for lodging of the stranded pilgrims at Ramban. Reports from Srinagar conveyed that it was also raining heavily yesterday at many places along the trekking routes leading to the cave shrine of Shri Amarnath in south Kashmir Himalayas. 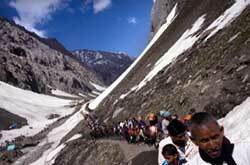 This was for the time during current season that Shri Amarnath Yatra has been suspended. The two-month-long Shri Amarnath pilgrimage, which commenced on July 1, has been going on smoothly as the administration has made all arrangements to ensure smooth conduct of Yatra.